Hi folks, here's a quick pic of an early one, no serial anywhere on this. One piece Wing neck, with abalone inlay, and a through body string plus bridge. My thoughts.............. Probably made between 80--83 Matsumoku Plant. Glad to hear from anyone with more info. that sure is a beaut, Cornish. That Abalone inlay on the headstock is really something. What a unique model. 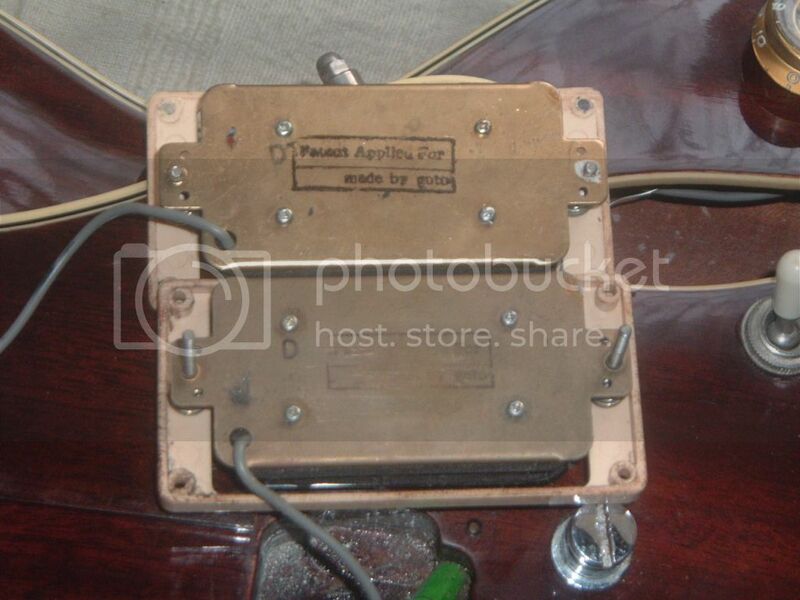 I wonder if it may have been a prototype with the unique bridge and finish. Two things I've never seen. The ears have the slight point of the later models.....really interesting. Hi Tio, just to add to the info, the seller reckons purchased early 80 as a "One Off" which back then meant prototype, or special unclaimed order. I've sent mail to a few older friends and a couple of music sites who may have some info, but as yet no replies. 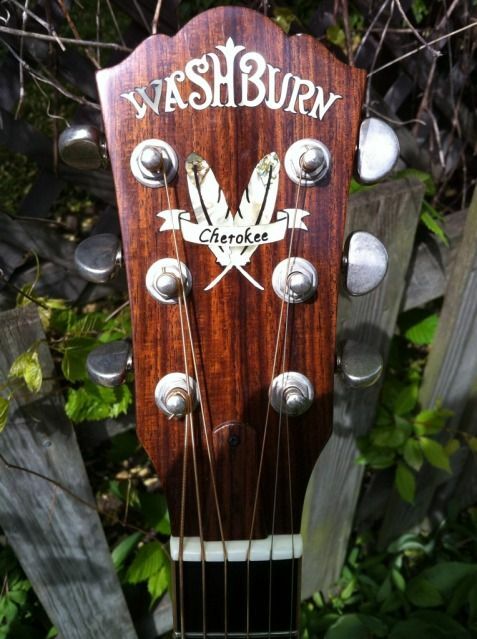 It would help if I could find out "For Sure" the first year Washburn started production of the series for general release. Been busier than I would have liked over the past week but got a couple of hours playing in. It's all good, smooth mellow to Jazz and beyond, through my Line 6 amp. Visiting a friend next week who has a small studio with Marshals etc, so that will be interesting. I've yet to re-string, but I may find out more when I take the pups out, I have no idea what make they are, but they sound very SDish, there could be a clue written under there. All will be revealed (or not) then. Just cleaning and setting up, thought a couple of detail pictures may help. Nothing written, no sign of a date stamp anywhere on this. Nearly forgot, it's fitted with a Leo Quan "BADASS" Bridge USA Pat 4,089. 733 Made In Germany. ore and more completely unique characteristics! And a wooden pickguard! Really fell into it CB. congrats again! I have what the factory says is an '81. I bought it new in '82. 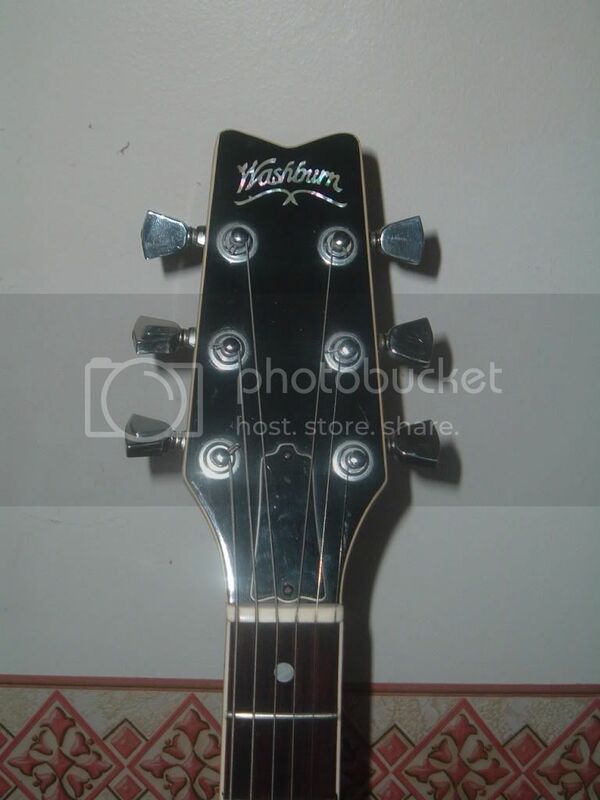 It has the strings-thru-body and the narrow headstock. I'm not sure how to post a pic or I would have. The serial number was super hard to find. It is under heavy finish on the back of the headstock. Hi jimf, most of the folks use photobucket to add pictures, it's free and relatively simple to use. As I state in my post I have searched just about everywhere for a serial, to no avail, also my model has no coil tap facility. So many questions about these guitars, every bit of info is welcome. 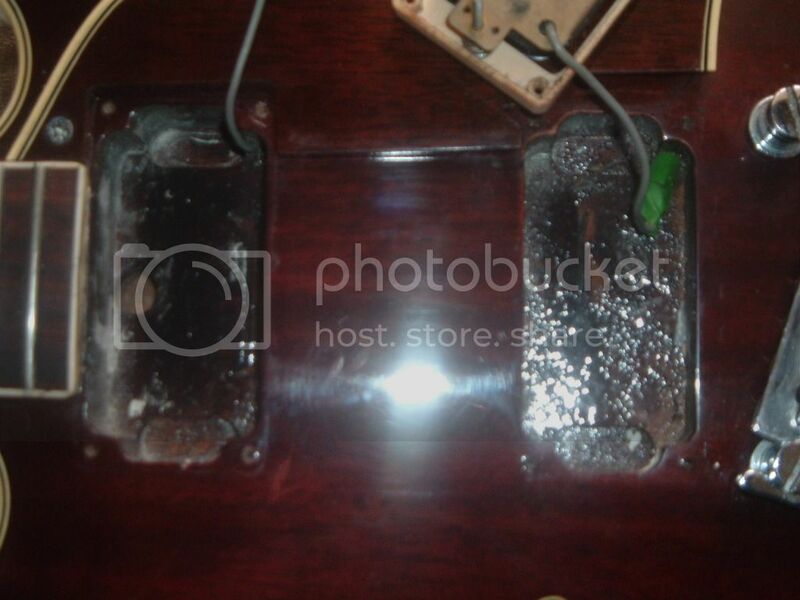 Have you ever checked the pickups for manufacturer, and looking through the soundhole, does your neck go through with a further piece of wood underneath to allow for the arched top and rear? 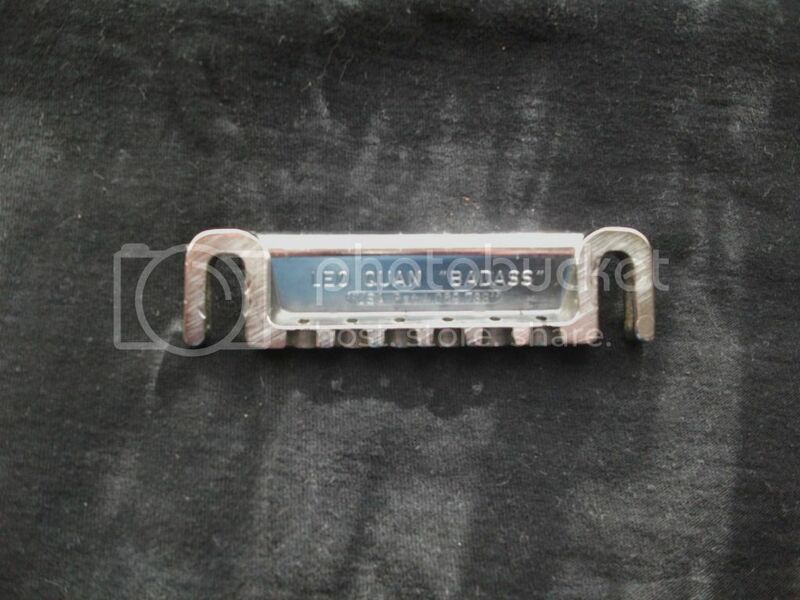 Does it have a MOP inlay on the headstock, or the usual wing type gold colour ? It would be great if you could post some pictures, if you've read all of this thread you know how much interest there is on this particular model and who made them. We hope to see some pics soon. There she is dirty. Everything is original. Oh, very nice indeed, another proud owner of "One of the nicer 335's". You've definately answered one of my Q's, they were rolling production in 1981 on this series, in which factory, nobody can say for certain. One thing is true, they could certainly put guitars together, I feel privileged to have one. 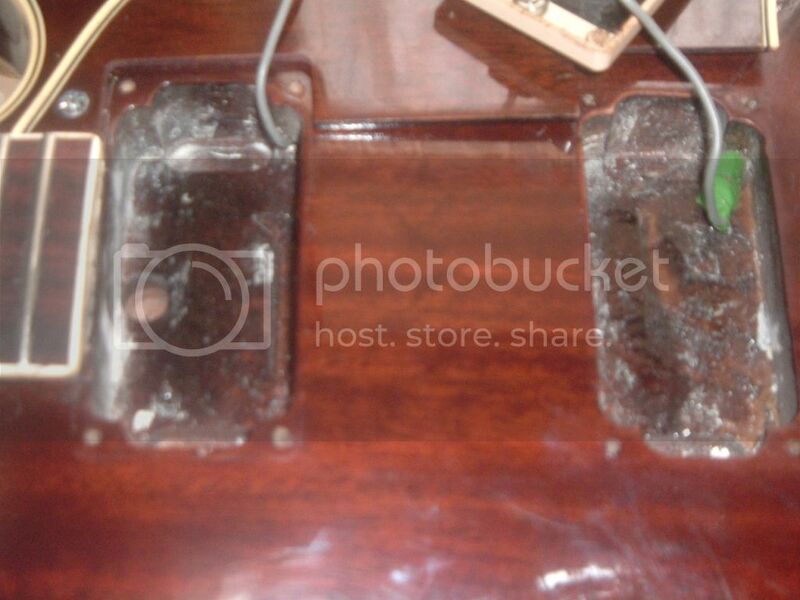 The split coil pots are worn out and the frets are fairly worn from all the years. 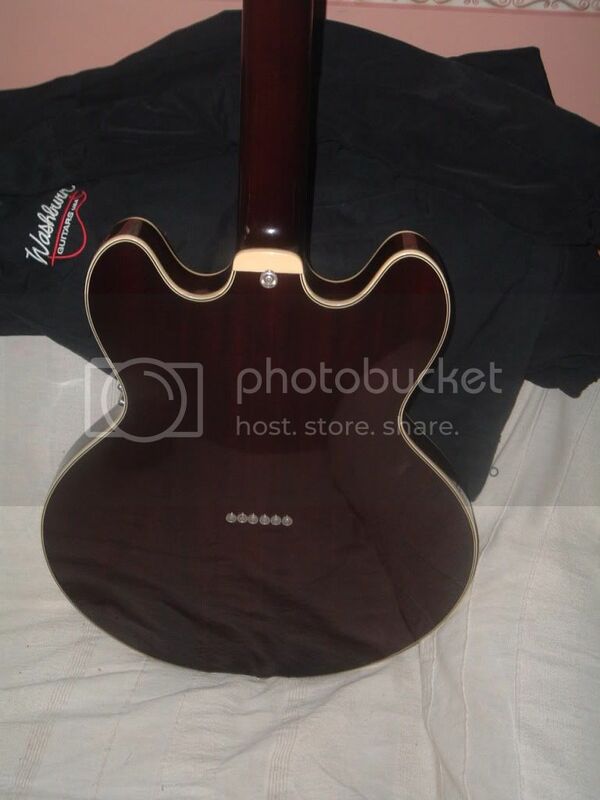 Oh yeah, another fine name "Peerless" , They used to make guitars for Gibson and others back in the day. I've not had a chance to play any of their instruments but they have a good rep amongst players in the UK, as a fair price, great sounding semi. Listened to a couple of demos on you tube, very nice guitar with attitude thrown in should you wish to be heard. But come on, you'll never forget the way the Washy sounded when you first bought it. Hell you've worn the frets out playing it, (All guitars should have stainless frets: period:) There's a few years of life left in the guitar, give the old girl a treat, crackle and pop your way through a nice slow blues number. Cheers. Just read this. I found the serial number, but it was hard. About time this thread had a bump, maybe someone out there has more information on the Japanese made HB 35s. Took the old girl out ('81HB35) the other night and was stunned at how resonant it was. 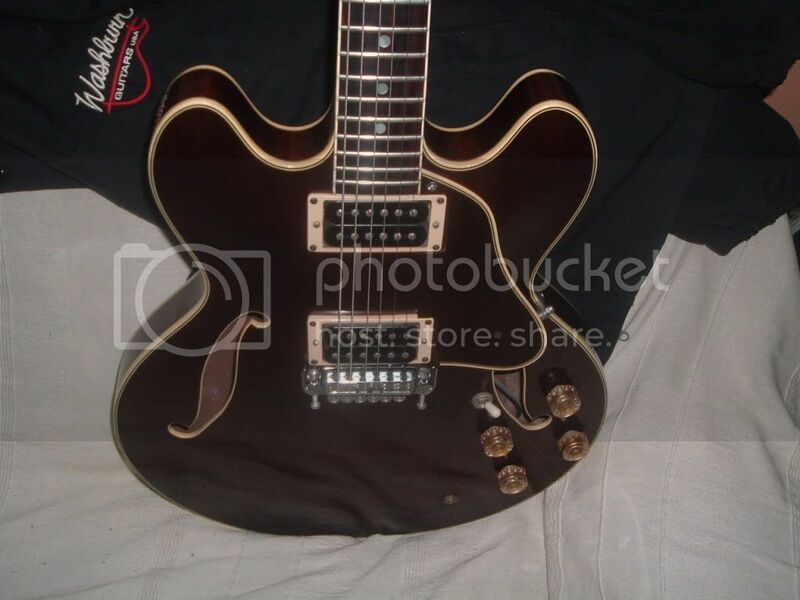 It was terribly easy to get the guitar to feedback the note I was holding and wanted, even more so than a Gibson 330 hollowbody type guitar I use. I played it 5 nights a week in bars back in the 80s and I don't remember it being this responsive. It has a powerful sound along with the resonance. Another surprise was, being in bars so many months on end, when I opened the case which hadn't been opened in a while, the smell was almost that of a new guitar. No smoke smell at all. I was considering selling it and a couple of other guitars I seldom use to buy a Music Man Luke. As of this post, she is off the market. I know it is 31 years old, but can it heal itself like that? The answer must be 'yes'.